If you haven’t noticed I am a big fan of curries. I could eat curry every day. Easy to make, so much flavor, and so many benefits for athletes! I always preach that the best way to recover from a hard workout or race is with a nourishing curry. I cannot tell you the last time I’ve popped a NSAID – it’s been so many years. Why take a pill created in a lab when you can use natural spices to keep inflammation at bay? As I enjoy curries so often, I find it convenient to mix up a few single-serving jars of my curry mix at a time. 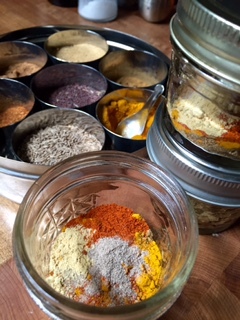 Although it doesn’t take that long to throw a mix of spices into a dish on the stove I find it quick and easy to simply open 1 jar and dump the entire contents in the pan when I am in a hurry to get dinner made! Coconut Quinoa and Sweet Potato Curry is one of my favorite go-to curry dishes. After my evening workout I can throw the quinoa and chickpeas in a saucepan while I hop in the shower and prepare the rest afterwards. Add chickpeas with liquid and quinoa to a small saucepan and bring to a boil. Cover and reduce heat – simmer for 15 minutes until liquid is absorbed. Use another saucepan with a steamer basket and bring water to a boil. Add sweet potatoes and steam for 5-10 minutes until tender. In a skillet, heat coconut oil over medium-high heat. Add onion and garlic and sauté until the onion is translucent. Add your spice mix, the chickpea quinoa mix, and sweet potatoes to the skillet and add coconut milk. Mix well and bring to a boil before covering and reducing the heat to low. Simmer 10-15 minutes, stirring occasionally, until the coconut milk reduces to a thick curry. This entry was posted in Friday Fuel, plant based nutrition, vegan nutrition and tagged curry, Friday Fuel, nutrition, plant based athlete, plant based nutrition, recipe, salad, vegan, vegan athlete, vegan nutrition by lljkline. Bookmark the permalink.